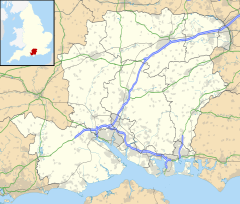 Basingstoke (/ˈbeɪzɪŋstoʊk/ BAY-zing-stohk) is the lairgest toun in Hampshire (Southampton an Portsmouth bein ceeties an Bournemouth nou bein coontit as in Dorset). ↑ "Hampshire County Council, Small Area Population Forecasts. Parish data: Parish total level forecast: (unparished area) Basingstoke & Deane". Hampshire County Council. 2016. Retrieved 24 October 2011. This page wis last eeditit on 28 Mairch 2018, at 05:43.